It is estimated that 75 to 85 percent of Americans will have some type of low side back pain in their lifetimes. Back pain often times can be painful and quite debilitating. There is good news for those searching for natural, non-surgical methods to alleviate their pain. However, it is estimated that half of those that suffer from an episode of low back pain will experienced a flare-up within one year. The cost for back related conditions is very high. It has been estimated that the diagnostic procedures associated with back pain cost $50 billion per year. Back pain is the second most common reason to see a doctor and one of the most common reasons for missing work. Only upper respiratory infections caused more people to go to the doctor’s office. The impacts on the individual are high. Ranging from chronic ongoing pain, to debilitating pain that interferes with quality of life and satisfaction a healthy, active lifestyle can bring. Most cases of low side back pain are the result of a mechanical problem and not caused by serious, underlying conditions, such as cancer, infections, fractures etc… The spine is a very complex structure and the conditions that affect it are equally complex. Fig. 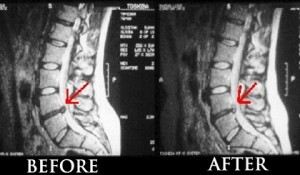 1 Low side back pain from disc herniation. Many times, back pain is caused from a sudden movement, lifting a heavy object, sitting in one position for long periods of time or from an injury or accident. Before the moment you feel the pain or injury, there is most often a pre-existing injury or loss of tissue strength and function in your spine. Luckily, there is a non-invasive, safe alternative for treating back pain, spinal decompression. Non-surgical spinal decompression generates gentle pulling and positioning that allows the spinal discs to decompress, or reduce the pressure they are experiencing. Decompression produces a negative pressure that allows the injury to heal naturally within the disc. Non-surgical spinal decompression is effective in treating many conditions including back pain, leg pain, neck pain, sciatica, herniated or bulging discs, degenerative discs (arthritis), and posterior facet injuries. Patients that undergo spinal decompression therapy are treated fully clothed. They may lie face up or face down depending on the recommendation from the doctor. This versatility allows us to set specific guidelines for your individual needs and condition. The patient is fitted with a comfortable harness that gently connects to your pelvis and another that is fitted to your thoracic area. The table is controlled by the doctor using a computerized console where the customized treatment protocol is entered into the computer. Each treatment last approximately 20 minutes. Spinal Decompression is a very safe and effective treatment for back pain, leg pain and neck pain. Although no treatment is 100% successful, has a very high success rate with full compliance from the patient. There will be certain activities you are asked to avoid while you are going thru your treatment protocol. You will be prescribed specific active rehabilitation exercises designed to strengthen and stabilize your spine. If you have further questions or know someone that would benefit from non-surgical spinal decompression, please contact our office at 360-705-0900, or click here to visit our website.